ContrastInfusion Lab is an Italian theatre workshop takes place at Edinburgh Palette every Friday from 22/03/2019 to 31/05/2019 for adults and young people. Please feel free to contact us at federica.molina.shak@gmail.com for more info. These General Iyengar yoga classes are suitable for students of all levels. Fridays 09:45 – 11:00 and Saturdays 10:00 – 11:30. Iyengar yoga is suitable for everyone. Regular practice can help with many minor health conditions and is very helpful for athletes in preventing strain and injury. All of our teachers have completed many years’ training and can help you progress, whatever your level of experience. Please note there is no Saturday class on 27 April, 8 June, 29 June. Come and learn the magic loop technique for knitting in the round using a circular needle. 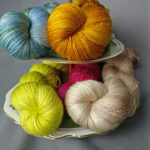 During this workshop you will learn knitting in the round using the magic loop method while making fingerless mittens. During the workshop you will be shown a few tips and tricks to have the perfect join and avoid those dreaded ladders! Notes will be provided on the day. You will be able to knit and purl with confidence and have an understanding of increases and decreases. Beginners level yoga class with Izabela Bysiak. This class is on Mondays at 6pm (we have other beginners classes on Tuesday and Wedneday evenings, Wednesday, Friday and Saturday mornings). 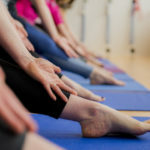 Iyengar yoga is suitable for everyone and in this class Izabela will introduce you to the basics, working week by week to develop your strength and flexibilty, leaving you feeling taller, refreshed and relaxed. All equipment, including mats, is provided and we can help you progress, whatever your previous experience or level of fitness. Term Pass costs £80 for 10 classes (to be used in 10 weeks, at any 10 classes). Introductory Pass costs £50 for 6 classes in 6 weeks. Single class costs £12. Passes can be used at any suitable class until the end of term. The class is suitable for anyone with minor injuries or health conditions (or anyone else) who needs to work a bit slower. In Iyengar yoga we use equipment – chairs, bolsters, blocks, belts, bolsters, blankets etc. to make asanas more accessible to those with physical limitations. Poses can be adapted to suit individual requirements. This class begins with gentle preparatory poses, moves on to simple asanas to stretch and align the body and ends with a few relaxing poses – longer holds in supported poses. Please note, there is no class on the 8th May – there are 9 Gentle classes this term. 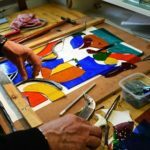 This course duration is 8 hours so it runs as either a 4-week evening class, or sometimes over a weekend (Friday 7-9pm and Saturday 10am-5pm). Please check the individual event dates/times below for details. The cost is the same. Lapsed Sewists (as a refresher if you’ve not sewn for a while and are a bit rusty). Artisan Stitch has won a certificate of excellence for Best Sewing Classes in Edinburgh. Jen has over 40 years of sewing experience and over 20 years in a teaching role.